Fruit and vegetable availability is often assumed to be a purchase barrier, yet fruit and vegetable availability does not necessarily result in frequent purchases. Rather, in-store marketing of less-healthy foods may be a major influencing factor in consumer spending habits regarding fruits and vegetables. A new study, in which in-store marketing focused attention on fruits and vegetables, resulted in an increased proportion of produce purchases keeping overall food spending the same. To study the effect of in-store marketing, researchers used a shopper marketing nutrition intervention and placed 10 large (6 by 3 feet) green arrows on the floor of a grocery. The arrows were placed in highly visible areas around the perimeter of the store and pointed to the produce section. On the arrows were sayings such as, “Follow green arrow for health,” and included a graphical representation of fruits and vegetables and emoticons to facilitate social approval. Two groceries were included in this pilot study, including a control grocery of the same chain with similar demographics and poverty levels with no arrows. Weekly sales reports detailing daily grocery department sales were generated by the retailer for the 14-day trial. During this period, the intervention store experienced a significant increase in the proportion of spending on produce compared with other food. Despite the increase in spending on fruits and vegetables at the intervention store, however, the total food spending per customer did not change significantly between the two stores. Example of arrow deployment in a grocery store. The results of the initial trial were duplicated over a longer period, at two additional stores with different demographics and poverty levels. This added validity to the initial results by extending the intervention to new groups of shoppers. However, Dr. Payne and his co-investigators recommend that future studies examine how long this intervention is likely to have an effect. 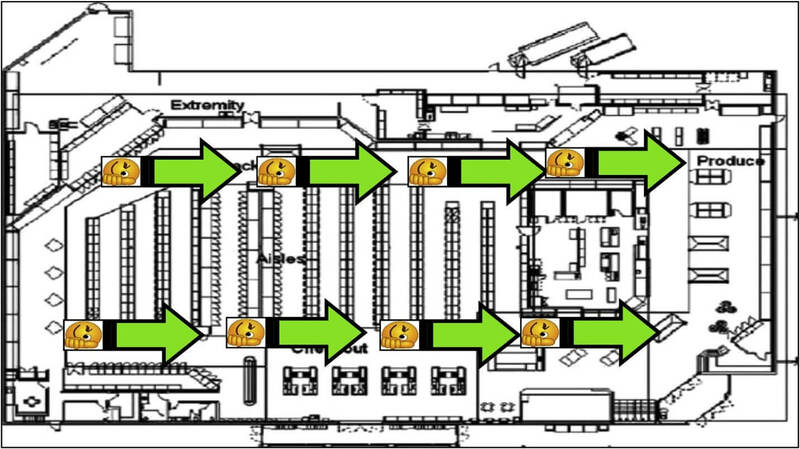 The article is "This Way to Produce: Strategic Use of Arrows on Grocery Floors Facilitate Produce Spending without Increasing Shopper Budgets," by by Collin Payne, PhD; Mihai Niculescu, PhD; David Just, PhD; Michael Kelly, PhD (doi: 10.1016/j.jneb.2016.05.001). It appears in Journal of Nutrition Education and Behavior, volume 4, issue 7 (2016), published by Elsevier. Full text of the article is available to credentialed journalists upon request; contact Eileen Leahy at +1 732 238 3628or jnebmedia@elsevier.com to obtain copies. To schedule an interview with the authors, please contact Collin Payne, Associate Professor, New Mexico State University, +1 575 646 6693 or crp@nmsu.edu. An audio podcast featuring an interview with Collin Payne is located at www.jneb.org/content/podcast. Excerpts from the podcast may be reproduced by the media; contact Eileen Leahy to obtain permission.